Welcome to Casey County Hospital, located in Liberty, Ky. We are a 24-bed, acute care, critical access hospital (CAH) that is Joint Commission accredited. Our facility offers quality service in a small personalized setting as all patient rooms are private with private bathrooms. Among the services offered are a long term (swing bed) program, intensive outpatient program (IOP), radiology, physical and respiratory therapy, and inpatient dialysis. The hospital operates two rural health clinics – Casey County Primary Care and Casey County Family Practice – as well as a program for senior adults, Casey County IOP (Intensive Outpatient Program). 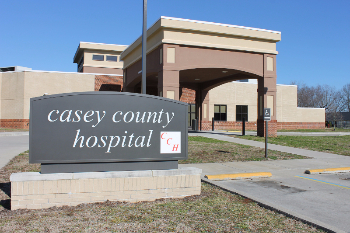 Casey County Hospital provides jobs for approximately 260 people and is the third-largest employer in the county. A new Casey County Hospital was built in 2008 and opened in September of that year. It replaced the structure that was built in 1945 and was known as Casey County War Memorial Hospital.